Wow you look so happy! Love the ribbon and wavy chipboard across the bottom of the photo. Have you grown your hair longer? or just straightened it like DD does? Jolene, this is just gorgeous. What a lovely photo of you. Just beautiful! this is stunning you have reached the criteria beautifully..and what a gorgeous photo of you..
Wow Jolene! Everything you do you do so beautifully and this is no exception. I love it all! 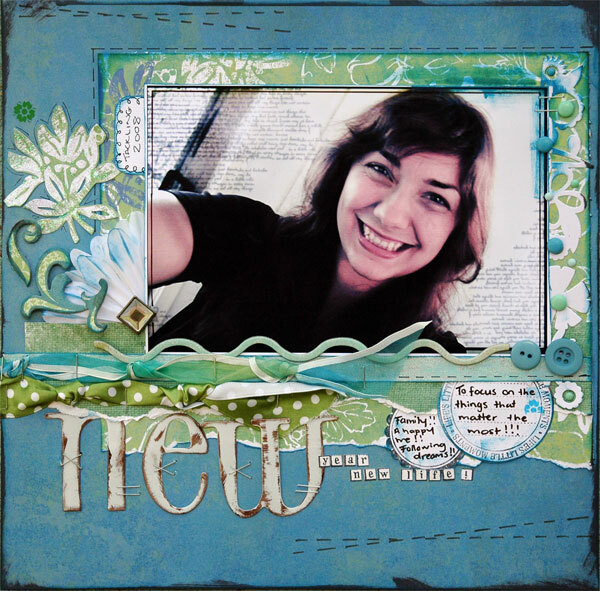 Gorgeous page Jolene, you have done so much cutting out! I really like this less cluttered LO but still so much to look at. This is really preety Jolene and you look so different here in this photo too. Wow I love all the textures and it's a great photo of you! Very nice. Love the work you have done with the ribbon. Gorgeous Jolene - love the alphas in your title! The colours just work brilliantly with your fun vibe in the photo and yes the ribbons look awesome. Stunning as always Jolene and I love your ribbons. Beautiful Jolene and such a lovely photo. This is such a gorgeous LO and a gorgeous photo of you too! Gorgeous as always Jolene. Love what you did with the ribbons below the photo, very effective. Great title too.